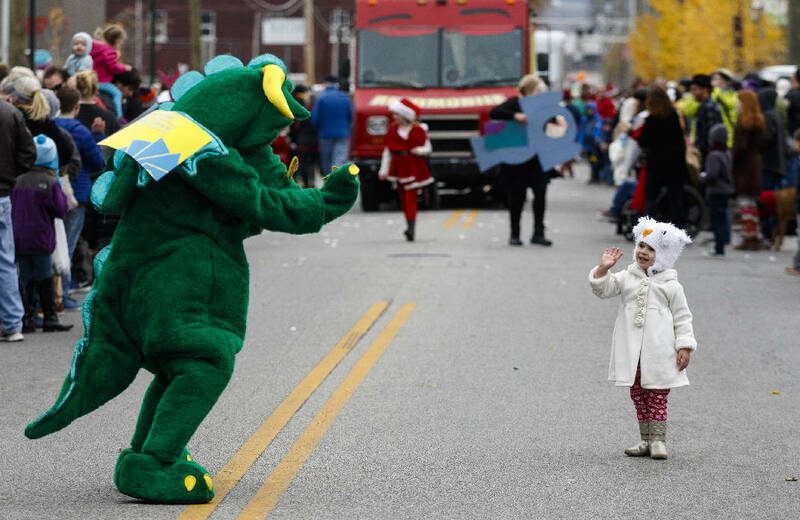 Lola Therrien waves to a person dressed as a dinosaur in the parade during the Mainx24 Festival on Main Street on Saturday, Dec. 3, 2016, in Chattanooga, Tenn. The annual 24-hour neighborhood festival celebrates Main Street and included a pancake breakfast at the fire station, music, arts, and caroling. For a full decade, Mainx24 has helped Chattanooga step into the most wonderful time of the year. On Saturday the scene was as busy as ever with food trucks, artwork and a woman playing an accordion in front of a tattoo parlor with her friend dressed like a devil. Mainx24 showcases an impressive range of creative work and talent the city has to offer, bringing together local businesses and artists to provide more than 100 events and points of interest scattered over the Southside. The event is, by definition, a 24-hour block party that has in no small way helped drive the development of the thoroughfare as a family friendly, interesting strip through Chattanooga's heart. "I love it. The traffic through here is fantastic," said Charles Wyatt, a penmaker who set up shop in the Area 61 gallery to sell his work. "You've got everything from woodworking to paintings. You name it. Everywhere you look you see something different." Wyatt, who is from Cleveland, Tenn., said this is his sixth year selling pens at Mainx24 and the event has helped him appreciate his own work and that of others more deeply. "It has really opened my mind up to the true definition of art," he said. "I know that people get my stuff and cherish it the way I do." The level of creative talent displayed during the event isn't lost on customers, some of whom spent the day browsing. Kate Sheets said the artwork was her favorite aspect of Mainx24. "I love seeing all the local artists displayed," she said. "I didn't know Chattanooga had so many." Dozens of booths were placed strategically among the regular establishments along Main Street with plenty of street food and beer to try as passers-by enjoyed the event. And far from crippling the brick-and-mortar establishments that are there year-round, for them the event is a sizable financial boon. Andrew Gage, a roaster at Velo Coffee, said the shop looks forward to Mainx24 every year. "It's bonkers, but it's fun," he said. "We do easily triple what we would do on a normal Saturday." Included on the list of events and places to while away a morning, evening or the whole day was an adult Big Wheel competition, improv shows and even a parade. "This event is incredible every year. The list of things to do is endless," said Dan Phillips. Phillips said he is from St. Louis but has family in town and has made it a point to come to Mainx24 for three years in a row now. "It's just good to see a city like Chattanooga take on something like this and make it happen," he said. "You don't see that a lot of places." Contact staff writer Emmett Gienapp at egienapp@timesfreepress.com. Follow him on Twitter @emmettgienapp.